There are many benefits to being a child of God, but I have to tell you about my personal favorite. When you live in a world where it is more common for things to be unfair than fair, conditional rather than unconditional, and untruthful rather than truthful, it is refreshing to know that God has flipped the script for his children. Satan schemes and plots against us desiring to see us fall. We see this great battle being fought between God and Satan and we have become collateral damage. You see, there is a reason for Paul’s statement in Romans chapter 8. You know, “All things work together for good …. ?” Yeah, I knew you knew that one! There is a reason why God’s will is always accomplished. No matter what weapons are formed, no matter what lies are told, no matter how much power there is, God always has the final say. Why, you ask? Great question! In the Gospel according to John, Jesus says this to his desciples: “These things I have spoken unto you, that in me ye might have peace. In the world ye shall have tribulation: but be of good cheer; I have overcome the world.” You want to know why all things work together for good? Here’s why: Jesus says that in him we MIGHT have peace. That’s because it depends on how much we are willing to trust him. Then he gaurantees that we are going to have trouble in this world. There are some people who still don’t get this idea because by now we all should be expecting trouble. These people become devastated at the very sign of trouble and are normally not leading productive lives because they didn’t trust in God. The last thing he says is the greatest and that was for us not to worry about the tribulations we will face as a result of living in the world because he has overcome the world! Did you get it? Let me break this down just a little bit more for you. A preaching friend of mine explained it this way: He told the story about a looney tunes cartoon. The Road Runner and Coyote. He talked about how the Road Runner was not the smartest of birds yet always seemed to escape whatever scheme the Coyote had for him. The Coyote considered himself a super genius and would come up with all these elaborate plots to catch the bird, but they all failed. 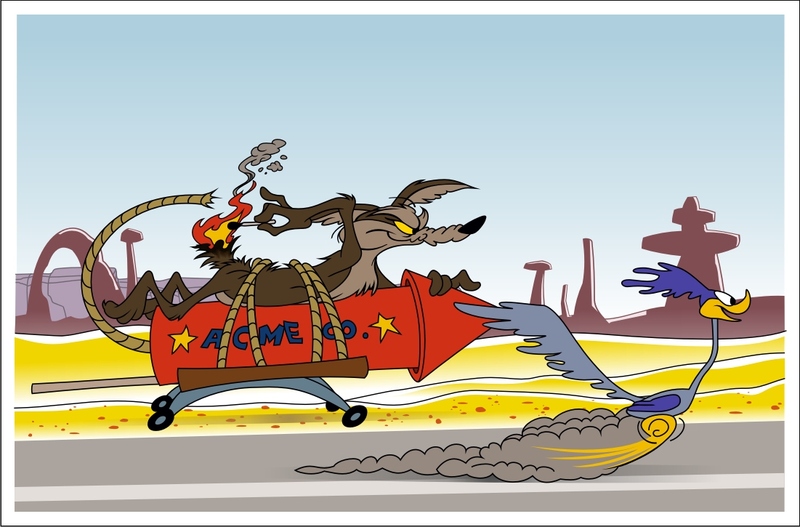 One particular time the Coyote had the Road Runner surrounded on a mountain top with dynamite all around. There was absolutely no escape — or so it seemed. When the Coyote blew up the mountain and the smoked cleared, the Road Runner was suspended in mid-air defing the laws of gravity still standing on a little piece of that mountain. The point is clear: No matter what Satan plans to do to you in this world, Jesus has already overcome it which means that anyone in Christ has overcome it as well. The Road Runner had a deal with the writer of the show. The deal was whatever predicament the Road Runner found himself in, the writer would get him out of it. If God has lead you to it, then he will lead you through it. This does not account for the negative experiences and pains we put ourselves through. These are the trials and tribulations that James 1:2 talks about counting them all joy. These are the same trials that God allows to make you stronger. These are the very same trials that 1 Peter 2 says are “thankworthy to God” if we end up suffering for having a conscious toward God. My friends, this is all about the relationship you have with God. Selah. I love the metaphor of the Road Runner! I have an agreement, a favorable standing, dare I say the grace of…the writer of the story. That’s a good deal. Thanks for the thought Clyde! Amen Helene! Favor is a wonderful thing!